One of the European Commission's most powerful officials has said that a no-deal Brexit would mean a hard Irish border. The comments from Martin Selmayr feature in a documentary made by ARTE, the Franco-German broadcaster. The secretary-general of the European Commission was filmed in a meeting with senior MEPs in late 2018. "Let's be very clear - if there is no withdrawal agreement there will be a hard border," he told them. What could no deal mean for Irish border? "This is the worst of all scenarios. "So for Ireland this situation would be very tough and that's why we need to do everything to prevent that." 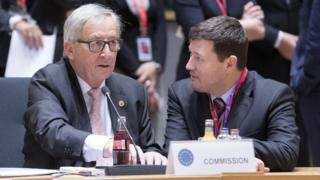 Mr Selmayr was previously chief of staff to Jean-Claude Juncker, the president of the European Commission. He served in the position from 2014 to 2018. The ARTE documentary The Clock Is Ticking had extensive behind the scenes access to the EU's chief Brexit negotiator Michel Barnier and other senior EU figures. In January, the European Commission's chief spokesman said it was "obvious" there would be a hard border in Ireland in the event of a no-deal Brexit. At that time the Irish government had repeated its stance that it would "not accept a hard border on this island". Since Mr Selmayr's comments the EU has intensified its no deal planning. The Taoiseach has said customs processes could take place away from the border but animals and food products present a more difficult challenge. The EU has strict rules for these products meaning they must be physically checked at a border inspection post.